Established in 1786, this town was named after the Governor of that time - 'van der Graaf' and his wife -'Reinet'. It was only the fourth district in the Cape to receive a seat of local government or a 'Drostdy'. Known to be a barren and untamed area, it became the outpost of white civilization for trading by the middle of the last century. 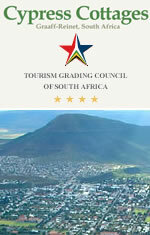 The picturesque Sneeuberg Mountain Range keep watch over this typical 19th century rural town. The town lies in the horse-shoe bend of the Sundays River and boasts more proclaimed national monuments than any other South African town. ies in the middle of the Karoo National Reserve (15 000 ha) where another wonder of nature, Valley of Desolation, keep silent memories of times gone by. Cypress Cottages Guest house offers 4 star, luxury accommodation in the heart of the "Great Karoo", Graaff- Reinet. There's no better place to take a break than in the vast quiet of the Great Karoo, in historic Graaff-Reinet. Situated in the historic town, Graaff-Reinet, the centre of the Karoo Midlands, this guest house is one of the culinary oases of South Africa.